Their English is not terrible. They usually have at least 5 years of formal English language education background, they know a lot about grammar in theory but THEY CAN´T USE IT. They suffer from lack of speaking practice with real people. So my biggest goal with my students has always been to help them gain that self-confidence when speaking English. And if we can have fun too, even better! I have recently started several English Without Books courses here in Brno, Czech Republic and decided to expose my students to real-life conversation in a real setting as soon as possible and more often than I have ever done before on my courses. 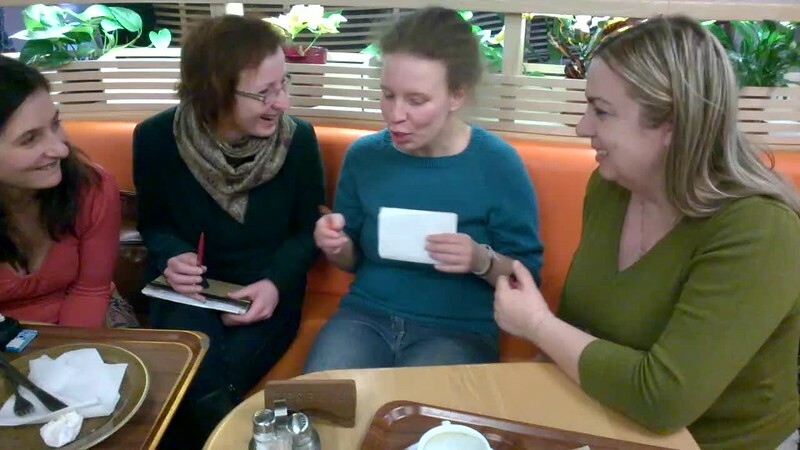 In my pre-intermediate “Light” course I organized our second lesson of the course in a vegetarian restaurant downtown with several lovely expat ladies from the Brno Expat Women´s Network which I am part of on Facebook. Setting this up couldn´t have been easier: I posted a note in the group saying I have six students who would appreciate real conversation with other women who speak English and set a date for us the following week. Three ladies accepted our invitation and what a delightful time we had, learning more about each other, each other´s cities, cultures, activities and languages. At first we all introduced ourselves with our names, ages, professional background and something interesting going on in our lives these days. I let the foreign ladies start in order for the students to get used to their accents and prepare their own introduction. Olga, from Russia, is very fond of knitting so the students were also invited to a knitting group she runs for expat women here in Brno. Then I introduced an activity I always like to do whenever we have a lesson with expats. 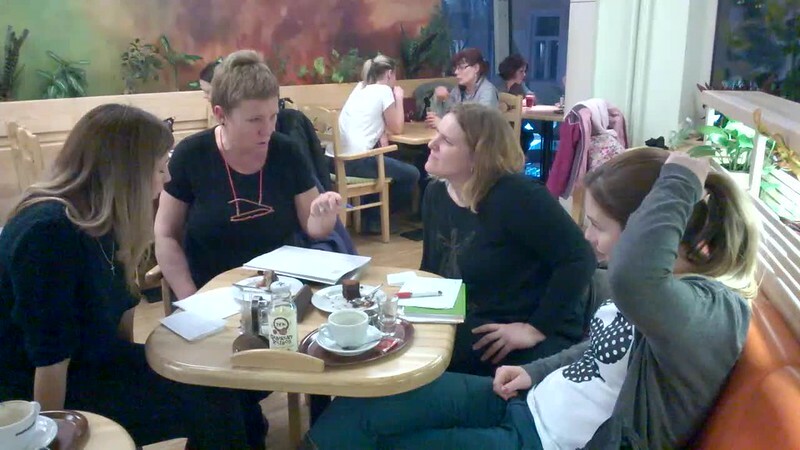 The Czechs go to one side of the table, the expats to the other, so they can´t really hear each other, and I give them 10 simple sentences for translation. From Czech to English for my students and from English to Czech for the expats. This time they included sentences “How do you say …”, “Come here” or “Why are you calling me”. Most of the time the Czechs get better results despite the fact the expats live here and have tons of opportunities to practise the language. One little exercise like this changes their mind that it is possible to learn the language without living in the country (e.g. the UK or the USA). We finished off with another speaking exercise. The expats were supposed to prepare 4-5 follow-up questions about the students. You can see how much fun we had as they were discussing things like “What would be your dream job?” or “What is the most disgusting food you´ve ever had”. Several students messaged me after the lesson saying how much fun they had and how inspired they feel now to continue practising their speaking skills, they can see how easy it is! So I would like to strongly recommend all the teachers out there to try this! And students of English, don´t be afraid to speak to foreigners in your town. You have no idea how much they will appreciate your interest in them. It´s a win win situation!